And, just like that, my quest for my comics holy grail was over: "Combat Kelly," issue No. 21, published in 1954. Thirty-two pages. Original cover price: 10 cents. Potentially jam-packed full of racist attitudes and Red Bull history. Granted, my quest had been a passive one. Something to look for at comics conventions and dealers. Something to browse through Internet auction sites, whenever I had trouble sleeping. A year or two ago, I'd almost successfully purchased a copy—fair condition, yellowed-but-readable pages—but that had somehow slipped through my keyboarding fingers. The seller's asking price had been about $20. Imagine my surprise, when I randomly found the whole issue had been posted for free on-line. I had been clicking in the dark, and, suddenly, there it was. Having grown up in the early 1970s, I'd never read any Combat Kelly comic books. Closest I got to war books was a few hand-me-down copies of Sgt. Rock ("Our Army at War") or G.I. Combat. Maybe an issue of Sgt. Fury and his Howling Commandoes. Combat Kelly? Until researching the topic for the Red Bull Rising blog, I'd never even heard of him. Combat Kelly was a character first published by Atlas Comics—one of the ancestors of Marvel Comics—from November 1951 to August 1957. The setting was the Korean War, which was fought between June 1950 and July 1953. My search for issue No. 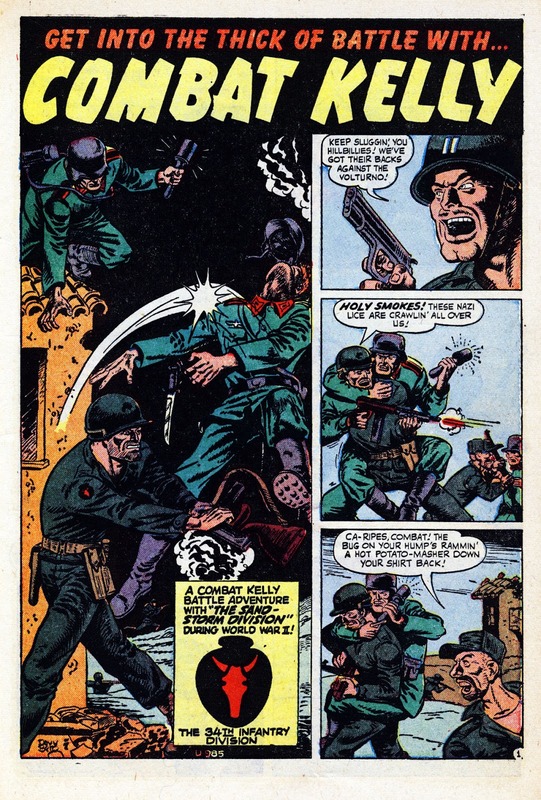 21 had little to do with Kelly himself, but in a secondary "back-up" feature, one that contained, to my knowledge, the only comic-book mention of the U.S. 34th Infantry "Red Bull" Division. Although the unit patch is correct, the story doesn't call the "Red Bull" by name. Instead, it uses as its title an earlier moniker: "The Sandstorm Division." When it was first formed in August 1917, the unit took its first nickname from the weather and terrain surrounding Camp Cody, N.M. Most references say the name changed in World War II, to better reflect the unit patch designed by artist and citizen-soldier Marvin Cone. The comic-book story accounts for only six pages of the 32-page issue. Ten pages (including inside- and back-cover) are advertisements. There's also a 2-page prose (text-only) story. In the 6-page main story, Combat Kelly and his pal Major Thorn get double-crossed by a South Korean they've rescued from execution, who turns out to be the notorious North Korean agent "Red Mary." Kelly and Thorn escape by flying a liberated MiG jet fighter. Asians are depicted in racist caricatures—agent "Red Mary," for example, is a cross between the Dragon Lady stereotype and Disney's Creulla de Vil. The lesson I take from all this? This comic is a document of its time. I should not be expecting high levels of artistic achievement, nor historical accuracy. There are three other stories, other than the main Combat Kelly story. One is a retelling of a German horse cavalry during the First World War. "True War Stories that Made History … Told by Combat Kelly" opens with the narrator's statement: "The story of the Battles of Belleau Wood is in all the history books, but it's be a different story if it hadn't been for a couple of Marines who loved horse, and hated heinies!" Filling out the issue: a 5-page story, art by Robert Q. Sale, regarding Cpl. Cookie Novak's rescue of a Korean child and later capturing the guerrilla "Bloody Mary." The plot—not to mention the naming the principal baddies as "red" or "bloody" something—feels a bit repetitive, even within a single issue. Combat Kelly is on a mission with the Sandstorm Division 34th Infantry Division battling Nazi forces under the command of Captain Thorn in Italy. Fighting Nazi soldiers, Combat spots an enemy boat along the Volturno River and tosses a grenade into it, it explodes just as it is passing under a bridge just as a German supply truck filled with ammo passes over it. The resulting explosion destroys both vehicles and destroys the bridge, hampering the Germans' abilities to get supplies into Rome. However it also eliminates their ability to get over to enemy lines. However, Captain Thorn calls for steel boats while a pontoon bridge is built to travel across the river with supplies. Along the way Combat and Cookie's boat is attacked by German soldiers. Pinned down by enemy artillery fire, Combat and Cookie use a boat to cross the river and sneak up on the enemy base using dynamite to blow them up, allowing their forces to sends tanks and other vehicles across the water safely. Unfortunately, other than thrill of seeing a "Red Bull" patch on the pages of a four-color comic, there's not much else that's special about the story. The writers might have plugged any unit connected with the Volturno River into the story. Apparently, they did just enough research to properly emplace their characters in both time and terrain. The story invites a question, however: I wonder if they somehow got it right that the 34th Infantry Division didn't take on the "Red Bull" name until after the comic's publication date of 1954? That sounds like another quest!